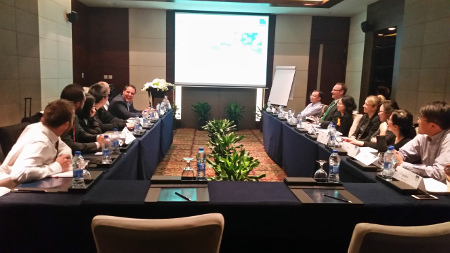 The first meeting of the TecAlliance Business Development Group for China took place on 1 December 2015 during the run-up to Automechanika Shanghai, and was attended by 12 representatives from the Chinese branches of TecAlliance shareholding companies. Participants were given information on TecAlliance’s current status, new products and planned developments in the Chinese market. They also had the opportunity to set out and discuss their assessment of the market as well as what they expect and require from TecAlliance. Yuliang Cao, who manages the east Asian market in the Business Development team at TecAlliance, is very satisfied with the meeting’s success. “We’re delighted that our invitation was accepted by so many representatives from key companies in the Chinese automotive aftermarket, and that they provided positive feedback on the event. The Business Development Group is extremely important to us because it allows us to learn more about what the Chinese market wants and needs, and to further optimise our industry solutions as a result,” says Cao. TecAlliance Asia Ltd. has operated as an independent company in Shanghai since 2014 with the aim of expanding business in the east Asian market. The initial focus is on China and establishing the firm’s electronic parts catalogue as the leading system in the independent automotive aftermarket there. The next Chinese Business Development Group meeting is scheduled for mid-June 2016. Participants at the first TecAlliance Business Development Group meeting in China.